The six-foot-deep chasm was first reported Friday, Feb. 8 on Salmon Street between 5th, 6th avenues. No — it's not the chasm between left and right, Beaver and Duck, or any of the city's other frequently warring factions. 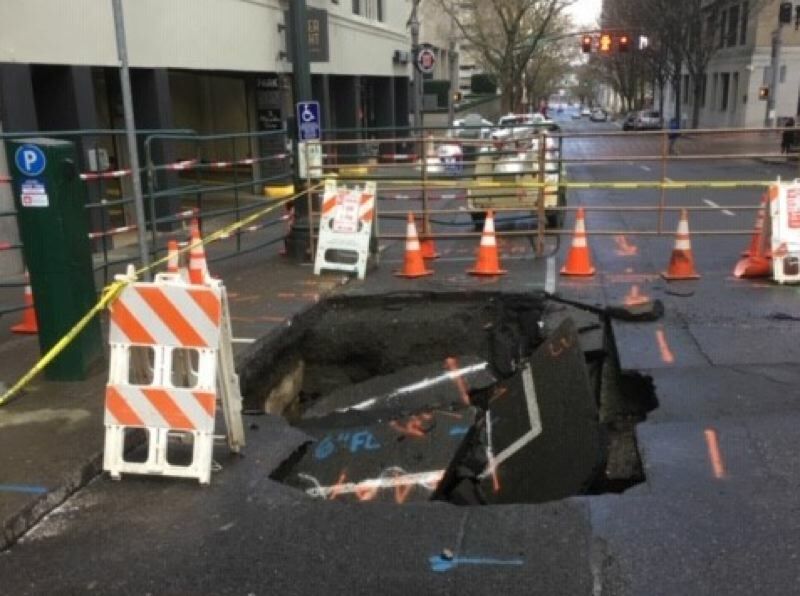 It's a literal sinkhole, and officials say the cavernous void will continue to shutter one lane of traffic on Southwest Salmon Street between 5th and 6th avenues through Tuesday evening. Water Bureau crews discovered the gaping abyss Friday, Feb. 8 while responding to a leak in a fire-prevention pipe for Fogo de Chão Brazilian Steakhouse. That lead workers to discover a damaged sewer pipe and the sinkhole. "In the course of cutting through the asphalt, they discovered what was underneath," explained Diane Dulken, spokeswoman for the Bureau of Enviromental Services, which is coordinating the reconstruction efforts. "When we discover a cavity, it's usually because we're doing repair work, and in the course of disturbing the asphalt we may discover a hole where there should be ground," she continued. 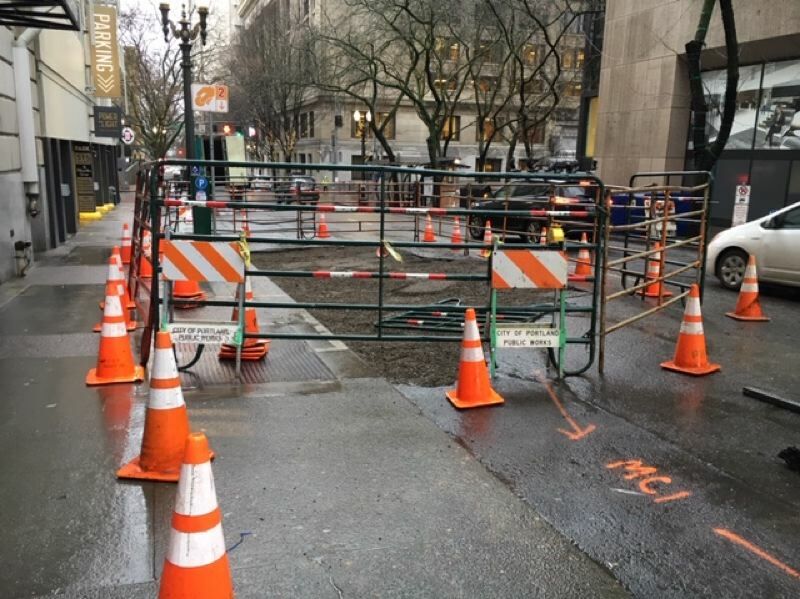 In this case, the hole isn't disrupting TriMet bus routes, though the barricades surrounding the six-foot-deep pit leave only one lane left open for vehicle and bicycle traffic. Dulken says the total dimensions of the hole are about 10 yards square, though only parts of that are visible from the street. Both pipes are now in working order, and the absence has been filled with dirt and rocks. But the job won't be finished until crews repave the road. "Crews coordinated across bureaus to respond quickly to get repairs done through the weekend, both night and day," Dulken said. "It's pretty straightforward." The cause of the sinkhole remains under investigation.